WHAT IS KAPOK AND IS IT ALL NATURAL? AND IS IT ALL NATURAL? Most people have never heard of Kapok (pronounced KAY-pock), but it’s been used for many years in pillows, cushions, and mattresses. Since it is water resistant, it was also used in life preservers before synthetic fibers. People are curious to know many things about Kapok like where Kapok comes from, and whether Kapok is non-toxic, comfortable, and washable. They are also interested in how Kapok compares to other natural fibers like cotton. Kapok is a silk-like fiber that provides a soft yet supportive fluffy feel. It is lighter than cotton and does not compress as quickly as cotton, wool, or down. Kapok fiber is extracted from the seed pods of the Kapok tree, which grows in tropical rain forests. In addition to making a comfy pillow, Kapok has other sought-after qualities. The fiber is naturally water resistant, so it wicks moisture for a comfortable, dry sleep. It’s also a clean and sustainable resource. When you buy Kapok, you help preserve the Kapok trees in the rainforest and help tropical region economies. Kapok is an all natural fiber and is free of harmful chemicals. It’s grown in the rainforest without the use of pesticides, so it's completely all natural. When it’s harvested from the Kapok tree, the seed pods are manually picked clean and spun. After it’s spun, the silky fibers are ready to be used in pillows and meditation cushions. Because Kapok is non-toxic, many people with chemical sensitivities find that it’s a good natural fiber choice, giving them another option to organic cotton. Are Kapok Pillows Moldable and Comfortable? If you like the soft feeling of down, then you’ll like Kapok. It provides a soft, yet supportive, fluffy feel. Many people turn in their organic cotton pillows after they try Kapok because the pillows are more comfortable, yet still provide the purity of organic cotton. There is much debate about whether the Kapok pillows are moldable. The higher lofts are firmer and less moldable, and the lower lofts are softer and moldable like a down pillow. 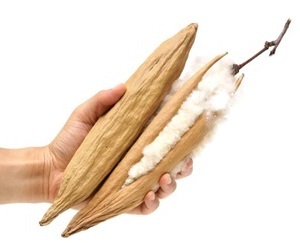 A zipper on your Kapok pillow is the ideal solution because it will not only make cleaning easier, but it will also allow you to adjust the amount of Kapok making the pillow perfect for you. Most Kapok pillow makers do not recommend washing Kapok pillows either by hand or in the washing machine. While some people do machine wash their Kapok pillows successfully, if you are unlucky, you can damage the fibers, ruining the pillow. The problem is that you have no way of knowing. Water chemistry and washing machines vary greatly and some may work well for Kapok pillow washing, and others, not. It’s better to protect your pillow with a protective pillow covering that you can wash frequently. A pillow cover made from organic cotton barrier cloth is densely woven and will keep pests like dust mites away from your pillow. If possible, look for Kapok pillows with a zipper which will make cleaning much easier. To clean a soiled Kapok pillow, you can spot clean it. Mix a solution of 3 parts water and 1 part vinegar. Spray the solution on the stain and put it in the sun. Make sure it is thoroughly dry. If necessary, you can use a hair dryer. To remove cosmetics, use rubbing alcohol and for blood, use hydrogen peroxide. You can also dry clean your pillows using a certified green dry cleaner.